There is frequent public transport to both trailheads from Pokhara. 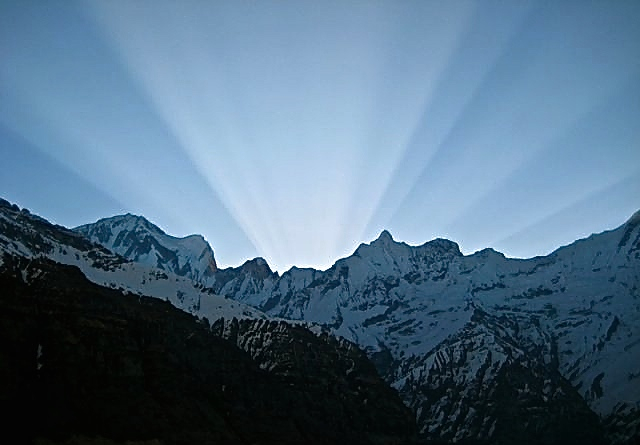 I combined the Annapurna sanctuary and Circuit treks, via Tatopani, Ghorepani and Tadapani. If you have the time and energy, I highly recommend this option. I finished my trek in Phedi. October/November and March/April are best weather-wise. Go for the latter if you want to avoid the big crowds. December to February can be brutally cold, and the trail above Doban will often be closed due to heavy snow. I used the trekking notes from Lonely Planet’s Trekking in the Nepal Himalaya. In addition, I used Nepa Maps 1:150,000 Around Annapurna Pocket map. An excellent map, containing all the detail you will need for both the Circuit and the Sanctuary treks. It is widely available in Kathmandu, and at around US$3 represents very good value. If for planning purposes you would like to purchase a map online before arriving in Nepal, try the National Geographic Annapurna Map or Schneider’s Annapurna Trekking map. All meals and supplies can be bought along the way. Accomodation can be found at the often atmospheric and always affordable teahouses. In other words, there is absolutely no reason why you should be carrying a heavy pack on this walk. Do I need a Porter? No. If you are reasonably fit and carrying a small pack, there is no need to hire a porter. By carrying your own pack you will have more freedom, less hassles and a greater sense of accomplishment. Do I need a Guide? No. The trail is clear and easy to follow the entire way. 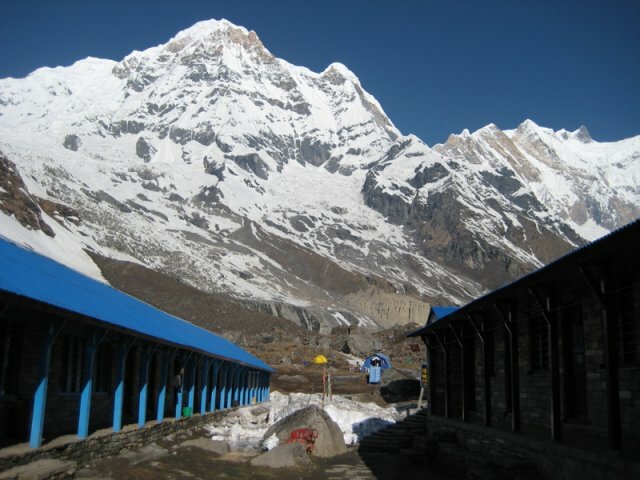 In regards to information about the local flora, fauna, geography and other points of interest, you can generally garner everything you need to know by chatting to locals, teashop proprietors and by reading one or more of the multitude of guide books written on the Annapurna (see above). What about the altitude? The key is to acclimatize gradually. As long as you take some basic preventative measures before and during your hike, your chances of coming down with altitude sickness are virtually zero. See Altitude in the HEALTH & SAFETY section for details. A wonderfully diverse trek, the trail up to the Annapurna Sanctuary winds its way through Gurung villages, bamboo and Rhododendrum forests, rice terraces and glacial moraine. The trail is well marked and easy to follow. 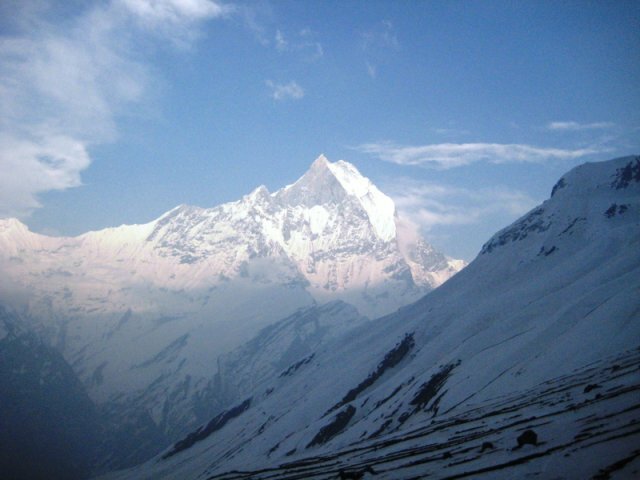 The highlight of the trek is the Annapurna Sanctuary itself. Situated below the south face of Annapurna, the Sanctuary is a mountain-ringed amphitheatre which in clear weather provides some of the most spectacular high altitude scenery imaginable. Don’t miss the sunrise. Hikers with knee problems should note that there are a lot of stone steps on this trek. Keeping your pack weight to a minimum will definitely help reduce stress on your joints. The hot springs at Jhinu Danda offer some welcome relief. Leave the tent at home, and enjoy the hospitality, good food and occasional hot shower on offer at the Tea Houses. Favourite places to stay were the upper part of Chomrong (great views & nice food) and the Annapurna base camp. Note that views at the base camp are generally best early morning. I highly recommend linking the Annapurna Sanctuary together with the Annapurna Curcuit for a fantastic 17/18 day (average time for fit walker carrying a small pack) trek. If you are short on time and have to choose between the two, I would recommend the Sanctuary Trek, due to less crowds (particularly in April/May) and no dirt roads.